Organizing and Labeling Classroom Library Books and Some Linkys! Well, it’s the last day of Winter Break [crying and pounding fists]. Okay, I am really not that upset, but being out of school for over a week makes it difficult to want to start up again. I don’t know about you, but I have developed some bad habits (sleeping until 10:00, staying up until 1:00, sitting on the couch ALL day in my comfy clothes without showering, obsessively learning about blogging, etc.). But I am looking forward to seeing my students and their bright-eyed smiles! Before I jump into more about how my library is organized, I’ll share my resolutions from A Peach for the Teach’s Resolutions Link-Up! Here are mine – click the image to link-up yours! I also found Tara’s post from 4th Grade Frolics about “Me”…not me…but you…focussing on you for the New Year…lol. Check out her blog! I’m linking up with her today and sharing! Just like her, I tend to pour everything into my job. Now that I have also discovered the world of blogging, I am not sure where I will fit everything in! The one thing for me this year is to find balance. I am not sure how I will do that…any suggestions are greatly appreciated! How do you all do it and do it all well? Onto the next topic! I thought I would share how I label my library books as they are the most precious item in my classroom! If you didn’t catch my post showing my library and how I organize the bins, you can check it out here! My individual book labels are just printed on average mailing address labels. As mentioned in an earlier post, I label each of the bins in my library by genre. I made my own labels that fit the Sterilite bins from Target – grab them here in my TPT store for free! The bin labels are colored coded to help kids find things! Each of my individual book labels match the genre bin label. Each individual book label also has a small colored sticker that represents the Fountas and Pinnell level. I organized my library this past summer and I actually wish I would have broken up the blue sticker levels a bit more. I would have added another color for levels M and N because there is such a big jump in difficulty between the H-N range. Anyway, it works for now. Here are a few pictures! If I know the exact F&P level, I write it on the sticker. If I don’t know the exact level, I just make a guess at what color sticker I think it would be and leave it blank. Here is our Library Reminders anchor chart that we have posted! The last item I will share today is our “Just-Right Book” anchor chart. Click on the picture to get those little bicycle pics if you want to make a similar chart! Now I need to plan for our first day back tomorrow! Since I was little, being a teacher was my dream! I had a pretend "school" in my basement and everyday I would come home and "teach" my pretend students. My dream has become a reality and I have now been teaching for 8 years! I love it (and sometimes hate it...hehe). I am rewarded every single day! I have just recently entered the word of blogging! I hope to share, give and get inspiration, connect with others, vent to relieve stress, and just enjoy my wonderful job! My First Linky and My First Facebook Like! I too am trying to figure out the balance between work, blogging, and taking care of me! I’ll let you know the magic secret if I ever find it. Hi there! I had fun reading your resolutions! Thanks for linking up! A new car for a new year– how exciting! I also need to grade daily! Happy New Year! Hi Brandi! Thank you for your comment! It probably sounds silly – but your comment and following made my day as you are my very first official follower (besides my family and close friends)! I am excited to be a part of the blogging world! I'm Kate and I have been teaching for 8 years (3rd grade currently)! I am grateful to have my dream job! I love it (and sometimes hate it...hehe). I am rewarded every single day! I have just recently entered the word of blogging! I hope to share, give and get inspiration, connect with others, vent to relieve stress, and just enjoy my wonderful job! Midnight FLASH FREEBIE – More Mystery Graphic Organizers! Snow Day AGAIN! Five for Friday Linky! 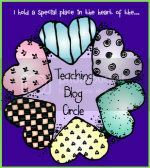 Join the Teaching Blog Circle!